And, lo, today marketh the day that Cian Roberts was introduced to the world of Dungeons and Dragons. Having seen me go off once a week to play this mysterious game, and even host many sessions downstairs in the Den, Cian accepted his first rulebook to read and character sheet to fill out with due reverence and excitement. 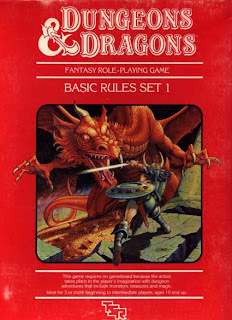 I have started him off with the Basic D&D set, the one published in 1983, in fact an original copy that I myself used more that twenty years ago, now complete with badly coloured pictures of female clerics and large snakes sitting atop piles of gold. Yes, of course I kept it, what? You don't just throw out stuff like that. The Basic rules from this era were written with kids in mind, and as Cian will be 8 in a couple of weeks, I'm sure he'll be on top of the game mechanics in no time. Also, with his already formidable imagination, I'm sure this game will grab him and not let go. The only problem will be in encouraging his friends to play. I'll have to start off as DM of course, but it is my sworn duty as Nerd Father. Good work, O. Good luck, Cian.